Cmd + Space is a very convenient hotkey combination you may want to use for Alfred. As it's a desirable one, you may find that another app or macOS service is reserving it. To set your hotkey, go to the Alfred preferences and view the General tab. Type your key combo (ctrl, alt and/or cmd + space/character) to set it. For example, Cmd + Space is a desirable hotkey combo, as it's such an easy combination to use. As a result, if you try to set Alfred's hotkey to Cmd + Space, you may find that you can't immediately to do so. Unable to set it? Take a look at the most likely reasons the Cmd + Space hotkey combo might be reserved elsewhere. If Cmd + Space doesn't work, that hotkey may be assigned to another feature on your Mac. 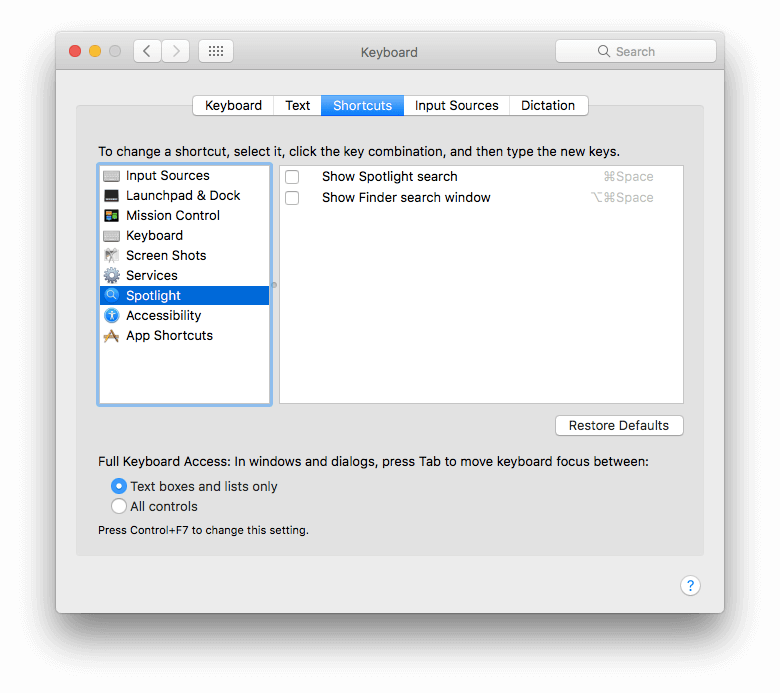 First, verify that it's not in use for Spotlight by opening Spotlight's System Preferences and disabling the menu keyboard shortcut under Keyboard Shortcuts > Spotlight. Go to Keyboard > Shortcuts and choose "Spotlight" in the sidebar, ensuring that the two hotkeys are not set to Cmd + Space, then disable them by unchecking the boxes. In the same Keyboard > Shortcuts preferences, choose "Input sources" and check that these are also not set to Cmd + Space and their boxes are unchecked. Return to Keyboard > Input Sources and remove the second language if you don't wish to use it. Even if you are not actively using that key combination for Spotlight or language management, macOS / OS X may be reserving it behind the scenes. If that is the case, in the Input sources, select a second language then go to the Keyboard & Text Input section again, untick the two checkboxes relating to input source. You can then go unselect that second language, once the key combos are changed or disabled. If you find that when pressing Cmd + Space, the Alfred window doesn't appear the first time, or that a few characters are missing from your query, there is most likely interference with the hotkey. First, follow the steps above to check it isn't in use by Spotlight, for language switching or by a third-party application. Next, if you're on High Sierra, take a look at your System Preferences > Siri, and disable the "Hold the Command key" option, in case you're holding the Cmd key and your Mac thinks you're calling up Siri.